Low admission temperature is an independent risk factor for morbidity and mortality in preterm infants.1 Thermal stability is enhanced by use of polythene bags during stabilisation,2 but it has been suggested that this may induce potentially harmful hyperthermia.3 We have measured the changes in body temperature during the first 15 minutes after birth in infants stabilised in polythene bags. For an eight month period, infants born at <29 weeks gestation in the Simpson Centre for Reproductive Health, Edinburgh were studied prospectively. They were laid on a temperature probe within a polythene bag immediately after birth and stabilised under a radiant heater set to maximum. Interscapular temperature was recorded every minute for the first 15 minutes of life. Transcutaneous temperature taken at a thermally insulated site (in this instance the baby’s back, insulated by a non-conducting mattress) represents core body temperature once the insulated skin warms to body temperature.4,5 Our observations suggested that this equilibration took around seven minutes (fig 1). We took the temperature at seven minutes as representative of the baseline and attributed all changes in temperature that occurred after seven minutes to the postnatal thermal care. Fetal temperature is higher than maternal temperature.6 We defined the upper limit of normal temperature at birth as 37.5°C. Hypothermia was defined as <36°C. Interscapular temperature during stabilisation. Values are mean (SD). Twenty seven infants (14 boys and 13 girls) were studied. Mean (range) birth weight and gestation were 916 g (490–1470) and 26+4 weeks (24−28+5). Mean (range) temperature at 15 minutes was 37.3°C (36.3–38.1). No infant became hypothermic. Sixteen infants had temperatures that never exceeded 37.5°C. Three infants with normal baseline temperature were warmed to temperatures above 37.5°C during stabilisation. The increases in temperature were 0.2°C, 0.6°C, and 0.6°C with the maximum temperature reached being 38.1°C. Eight (30%) infants had baseline temperatures above 37.5°C: of these, five gradually cooled towards 37°C during stabilisation and the remaining three warmed by 0.2°C, 0.3°C, and 0.4°C with a maximum temperature of 38°C. Figure 2 categorises temperature progression of the infants during the 15 minute study period. Flow chart categorising temperature progression from baseline to 15 minutes of age. These data confirm that early neonatal hypothermia can be eliminated by the use of polythene bags during initial stabilisation of small preterm infants. A significant proportion (30%) of infants are probably hyperthermic at birth. Iatrogenic temperature increases occurred in a minority of the infants in this study and were small. The significance of transient small temperature increases is uncertain. Costeloe K, Hennessy E, Gibson AT, et al. The EPICure study: outcomes to discharge from hospital for infants born at the threshold of viability. Pediatrics2000;106:659–71. Vohra S, Frent G, Campbell V, et al. Effect of polyethylene occlusive skin wrapping on heat loss in very low birth weight infants at delivery: a randomised trial. J Pediatr1999;134:547–51. Newton T, Watkinson M. Preventing hypothermia at birth in preterm babies: at a cost of overheating some? Arch Dis Child Fetal Neonatal Ed2003;88:F256. Dollberg S, Xi Y, Donnelly MM. A noninvasive transcutaneous alternative to rectal thermometry for continuous measurement of core temperature in the piglet. Pediatr Res1993;34:512–17. Dollberg S, Rimon A, Atherton HD, et al. Continuous measurement of core body temperature in preterm infants. Am J Perinatol2000;17:257–64. 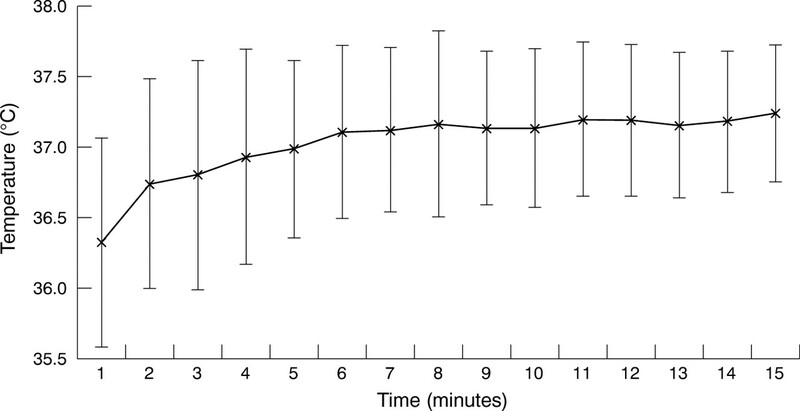 Walker DW, Wood C. Temperature relationship of the mother and fetus during labor. Am J Obstet Gynecol1970;107:83–7.